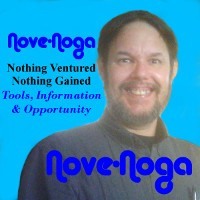 Recent changes in IBO Toolbox as we evolve to IBO Toolbox V3 mean changes in the way we do things. 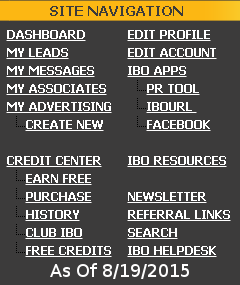 I used to recommend that you start your day at IBO Toolbox by claiming the daily Free Credits in the Credit Center. I now recommend that you start by selecting the “IBO Featured Member” from the IBO Wall Filter and comment on one of their wall posts to congratulate them on their honor. This is also a great time to visit and comment on one of the FMOTD's Press Releases. Then claim that daily credit. 1) Complete as much of your IBO Profile as you can. The first three steps earn you your Profile Bonus of 500 Credits when you return to the Dashboard. SITE NAVIGATION – EDIT PROFILE. Adding your Social Networks, Business Links, and Videos is like putting your house in order before you get visitors. The Front Page Editor is where you can create your own welcome for visitors to your IBOsocial Profile Page. *Note: With the exception of your Profile Image, all images and videos used on IBO Toolbox must be hosted online. If you don't have your own website, I recommend ImgBox.com, a free online image hosting service that I have found to be very reliable. 2) Set up your 468x60 Banner Advertising in SITE NAVIGATION – MY ADVERTISING. Of the 500 Credits that you earned for setting up your profile, you will need to convert at least 100 Credits to views to start your advertising. *Note: It may take a few views before the Advertising Star is activated. To start it sooner, I recommend choosing all advertising venues and the fastest display setting. Reset as soon as you have earned your Advertising Star. 3) Write an introductory Press Release on your Word Processor. The current Press Release Editor handles word processor documents fairly well. Links, Bold, Underlined and Italic elements will carry over nicely. Highlighting and image inserts will need to be done in the PR Tool. Remember that you can only use Hosted Images on your IBO Toolbox Press Release. The current maximum width (IBO V3) is about 670 Pixels. Post your Press Release in SITE NAVIGATION – IBO APPS – PR TOOL. *Note: This is the default format. I highly recommend that you reset the Text Color to Black (or your choice) to avoid the default gray. If your word processor did not already change the text size, I recommend a minimum of 12 Pt for the font-size. I prefer 14 Pt. Also, the default for Links is now Gray with a hover color of orange. I like “Blue” Bold links. Be sure to review your new Press Release and check your links. You can return to the PR Tool if you need to do any editing. 4) Return to the IBO Toolbox Dashboard. 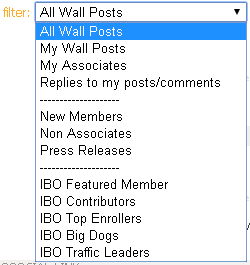 If you haven't already, select the “IBO Featured Member” from the Wall Filter. Locate one of their Wall Posts to offer a Reply of Congratulations on their achievement. Refresh your page to return to the main Dashboard and offer Replies to a few more Wall Posts. IBOTOOLBOX ONTRACK in the right-hand column will indicate when you have earned each IBO Star. You may need to refresh the Dashboard one more time to activate the Star. If Steps 1 thru 3 of your profile are complete, your Advertising Star is active, you have posted your Press Release within the last 48 hours and your Wall Post Star is active, you should now have four IBO Stars by your name at the top of the Dashboard and on your Wall Posts and Replies. 5) Now it is time to bring yourself to the attention of your fellow IBO Members. Check your Press Release for any comments. If there are any, you can Reply on your Press Release. Then visit their IBO Profile by Clicking their Name. Select their most recent Press Release from the list on the left-hand panel. Read their Press Release and leave a relevant comment. After that, I suggest that you visit your “Just Joined” Wall Post. Anyone who welcomed you to IBO Toolbox is likely to respond to any comment you make on one of their Press Releases. It takes a few Replies on Press Releases to activate the Press Release Comments Star. You will need to return to the Dashboard to confirm the star. When IBOTOOLBOX ONTRACK and your Stars do not agree, refresh the Dashboard again. *Tip: To keep track of this exchange, Like their Press Release as you comment. When you have returned the favor of their comment on your post, reply to their comment on yours. Then you know when you owe a comment in return. Those Members with Five or Six Stars earn 5 Credits for their first IBO Member Comment/Reply posted on a Press Release. (Double for IBO Contributors.) A few Wall Post Replies are necessary each day to earn your Wall Post Star but they do not earn you credits. There are Video Instructions available in SECTION ASSISTANCE in the right-hand column of most IBO Toolbox Pages. The most recent Webinar is usually available at http://www.ibourl.net/recordedwebinar. *Note: To earn 400 Credits for the Webinar, attend the live Training Webinar on Wednesdays at 8PM Eastern. See the link on the Dashboard to sign up. * Another good resource is MarketWithKris. There you can earn Credits for IBO Training and become more familiar with the platform. You can also ask your Veteran Associates. Most of them will be happy to share their experience. Finally, if you haven't found the answer elsewhere, visit SITE NAVIGATION – IBO HELPDESK. IBO Toolbox works when you Participate. A completed Profile, Five IBO Stars and a recent Press Release indicate that you are Participating in the IBO Toolbox Platform. As you Participate by reading and Commenting/Replying on your Associate's Press Releases you will find that many will return the favor by visiting and commenting on yours. In this way, Participation in IBO Toolbox helps send your messages around the World. Participation is what makes IBO Toolbox Work.